The first 3 photos show the refinishing completed. The last 3 photos show the tables in their faded and worn condition. This is a refinishing project for a local coffee shop. The tables are a little over 5 years old and they sit in a coffee shop with floor to ceiling windows around the dining area. The customer wear and U.V. degradation has taken the color from it’s original reddish-brown to a golden oak. The tables are made of quatersawn oak and were manufactured by a local furniture maker that I know. He did a very nice job in the original construction and finish of the tables. He still builds furniture on the side but he makes a better living (a much better living) as a regional manager for a large company. I know the owners of the coffee shop due to my own frequent stops to purchase their stimulating brew and they are also the owners of one of my Shaker Benches. Being that I support them, they like to support me – I appreciate that. The colors were achieved by starting with an orange dye and followed by a custom mixed BAC wiping stain from Sherwin Williams. The finish is M.L. Campbell’s Krystal. It is a catalyzed varnish that I have to mix as I use it. This finish wears like iron. When I saw the thumbnails I was wondering why you would have to refinish. When I enlarged the picture I understood why. The old finish looks like that plastic fake wood laminate you found in homes in the 70’s. Great job Todd. Beautiful tables and beautiful work (I would expect no less from you) Whats the source for your finish, hows the shelf life, I would never use the amount you do. Great job, Todd. The difference is literally like night and day. Nice color on the refinish. The quarter-sawn flecks look a little wild on the faded finish. This link to ML Campbell's site has a “Find Distributor” button. From there you can find out where to purchase the product locally. Mixing the finish is super easy. The finish will not dry if the catalyst is not added. Shelf life is indefinite when until catalyzed. Pot life is 12 to 16 hours. Things like temperature affect the pot life. When it starts to set in the pot, it gets little crystals that appear as contamination when you spray it on the project. I left a few ounces in a mixing cup for 3 days and it remained as a liquid, but when you rubbed a little between your fingers the gritty crystals could be felt. Out of curiosity, what’s a gallon of Krystal and a gallon of catalyst go for in your area? There is a supplier not far from here and if it isn’t ridiculously expensive I might give it a try to see if I can get decent results. Socal – Dang! VOC contents must be an issue for Cali regulations. I did some testing on this product and I am amazed at it’s durability. Krystal, like the MagnaMax and other pre-cat lacquers, reaches 80% cure in the first 2 days. It takes about 28 days to reach full cure. I did my durability testing after a couple of days and was quite impressed. Prices are as follow for me but may vary to location. Also keep in mind that I have a pro account with my supplier. Krystal 1 gal $36 Good indefinitely until mixed with catalyst. Will NOT DRY without catalyst. 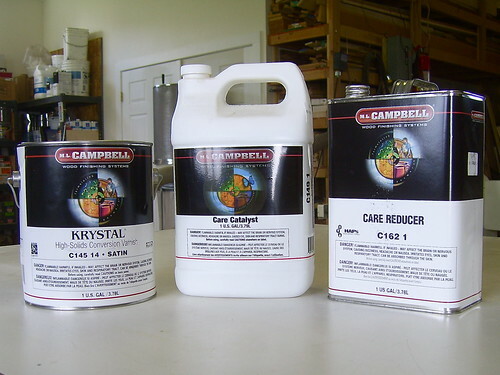 Care Catalyst 1 gal $26 This will last a long long time because it is mixed at a 10:1 ratio with Krystal. That is 10 parts finish to 1 part catalyst. Reducer (thinner) 1 gal $21 This thinner that is specific to the Krystal should only be added about 10 to 15% to work in spraying equipment. Todd, I’ve noticed you use both pre and post-cat lacquers. I’m curious why and when you switch between them. Unless I’m mistaken, the primary difference is the pre-cat is ready to use while the post-cat needs the catalyst. I would think primarily one would want to go with the post-cat because of the longer shelf life and the ability to mix-up what you need. Obviously, there must be some advantage to the pre-cat stuff or you wouldn’t use it. Greg – Your question is a good one. MagnaMax is a wonderfully durable pre-cat lacquer and is rated for use on kitchen and bath cabinets. I know of a furniture maker that even puts it on dining tables although I feel that this may be pushing it’s limits. MagnaMax also contains nitrocellulose so it can take on a yellow tint over time. I love this product and leave it in my pressure pot unless I need to load up the Krystal. Krystal offers the ultimate in durability. It is a catalyzed varnish and it is considered a water white clear coating. This means that it is supposed to maintain a crystal clear look over time. I did some testing on the finish and was very highly impressed. 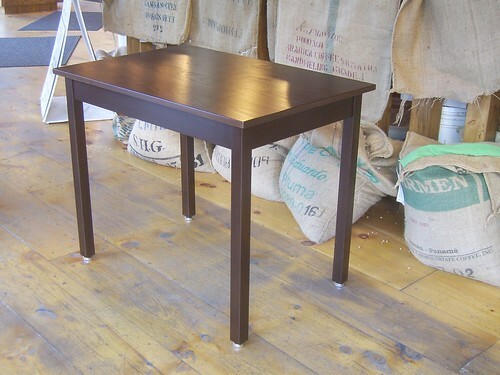 I love this finish but it has a pot life that is basically good for one working day in my shop so I mix and use only when needed for projects like dining tables. It produces a harder finish than the MagnaMax. I am not a salesman for MK Campbell. I do not receive anything from ML Campbell for saying any of this. I use it because I have to warranty my product and it fits my needs as a professional. You can, where available, purchase the same products. Keep in mind that it is a lacquer solvent based product and must be handled with care personally and adequate ventilation must be provided. As always the finish is 50% of the project, in this case 100%. Well done, my friend. I love refinishing stuff – since the sanding job is fairly easy (I find). Though this looks like you had a few scratches and dents to get out! gotta try that iron finish myself … like the darker version, but that is some very good oak to start with.